Heat stroke occurs when your pet’s internal temperature becomes dangerously high, generally about 106 degrees F. It can be due to being locked in a hot car, or to over-exercising in a hot and/or humid environment. Either way, it leads to a cascade of very serious conditions that can result in brain damage, organ failure, and death. A chemical reaction occurs and actually breaks down the cells in your pet’s body. Have you ever noticed how hot it can get inside your car on a summer day, even though it is not that hot outside? That’s because a car acts like a greenhouse, trapping the sun’s heat. A Stanford University test found that even if it’s only 72 degrees outside, a car’s internal temperature can rocket to 116 degrees within an hour. When it’s 85 degrees, the temperature inside the car increases to 102 degrees in 10 minutes, and 120 degrees in 20 minutes. What is the emergency treatment? If you suspect that your pet has heatstroke, you should first try to lower the body temperature by moving your pet to a cool area. Cooling procedures should begin before driving to the vet. You can soak your pet with cold water, but don’t use ice-cold water, as it may worsen things. If available, use a fan, as it will cool your pet down more quickly. Call your vet or an emergency clinic, and take your pet there as quickly and safely as possible. It is important to call the clinic ahead of time so that the staff can be prepared by the time you arrive. If your pet is alert enough, offer small amounts of water or ice cubes. Stop cooling measures when your pet reaches 103 degrees, or your pet may actually become too cold. At the vet, similar measures will be taken. In addition, lots of IV fluids are given. 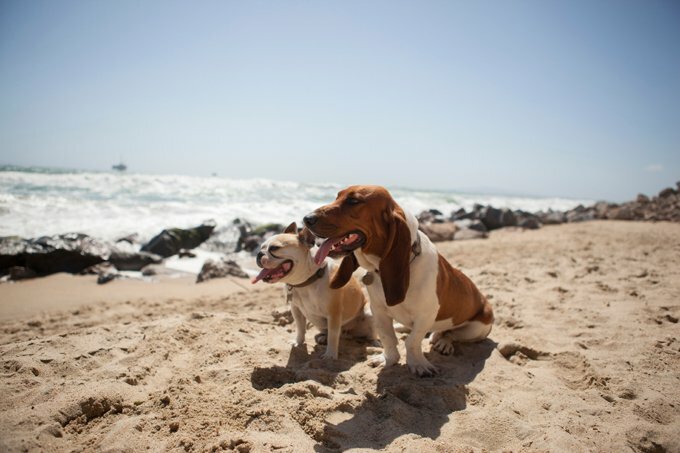 Can I prevent heat stroke in my pet? Absolutely. There are some simple, common-sense steps you can take to prevent heat stroke. On hot, humid days, keep your pets indoors, except to eliminate. If they must be outside, provide plenty of shade and fresh water. Make sure that your pet can’t spill the water source. Or use several bowls in different places. Add ice cubes to the water bowl to keep water cooler longer. Let your pet play in a cool water “bath” or a kiddy pool. Plan ahead and make sure the shade will still be available as the sun changes. Never leave a pet unattended in a parked car, even for “just a minute.” Leaving the windows partially rolled down will not help. Limit outdoor activity to the early morning and late evening, when temperatures are somewhat lower. Carry water with you when walking your dog. Notice any heavy panting, loss of energy, weakness, stumbling, or any of the signs listed above. If your pet seems to suffer from the heat, stop in a shaded area and give some fresh water. If things don’t improve quickly, take your pet to your vet. Heat stroke is no joke. Don’t let it happen to your pet! Now is a good time to learn how to take your pet’s rectal temperature. Ask your vet or a nurse to show you how to do it safely with a digital thermometer. If you see a pet locked in a car, please call your local animal authorities immediately. You may feel weird about it, but you may save a life! You can also check out www.mydogiscool.com. This site is designed to help spread the word about the dangers of hot cars. Resources include downloadable posters and “It’s hot!” flyers that can be used when a dog is left in a hot car. There is an “Is it Too Hot?” weather forecasting tool that allows you to enter your zip code and see if it’s too hot to take your pal along in the car. Dr. Phil Zeltzman is a board-certified veterinary surgeon at Valley Central Veterinary Referral Center in Whitehall, PA. He performs surgery on dogs, cats, and “exotic animals,” and is a Diplomate of the American College of Veterinary Surgeons. To subscribe to his weekly newsletter, click here.